Israeli soldiers resorted, Friday, to the excessive use of force against Palestinian protesters across the occupied West Bank and the Gaza Strip, causing scores of injuries, as the protesters held their weekly processions against the Annexation Wall and Colonies, and for the twelfth consecutive week, marched against the illegal U.S. recognition of occupied Jerusalem as the unified capital of Israel, in violation of International Law and numerous United Nations and Security Council resolutions. The soldiers fired dozens of live rounds, rubber-coated steel bullets, gas bombs and concussion grenades at the protesters, causing dozens of injuries. In the al-‘Isawiya town, in the center of occupied Jerusalem, the soldiers attacked nonviolent protesters as they matched near the western entrance of the town. Dozens of soldiers were deployed in the village, and around it, and installed many roadblocks. 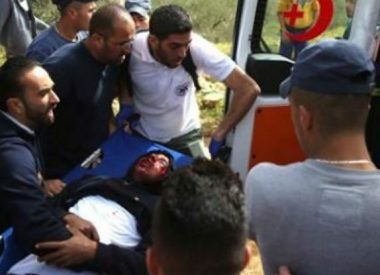 In Ramallah, in central West Bank, the soldiers attacked protester who matched in the al-Mazra’a al-Gharbiyya village, northwest of the city, marking the 49th anniversary of the establishment of the Democratic Front for the Liberation of Palestine (DFLP). The soldiers fired dozens of gas bombs at the nonviolent protesters, causing many to suffer the effects of teargas inhalation, in addition to causing fires in olive orchards. The protest was held against a recent Israeli decision, illegally confiscating large swaths of privately-owned Palestinian lands to pave a new segregated road for illegal colonizers, northwest of Ramallah. In addition, the soldiers caused many Palestinians to suffer the severe effects of teargas inhalation near the main entrance of al-Biereh city, near Ramallah, while many youngsters hurled stones and empty bottles at them. In related news, the soldiers shot and moderately injured a child with live rounds in his leg, in the al-Janiya village, west of Ramallah, before he was rushed to Palestinian Medical Complex. Also in Ramallah, the soldiers attacked the weekly procession against the Annexation Wall and colonies, in Bil’in village, west of the city. In Hebron, in southern West Bank, the soldiers attacked dozens of Palestinians, who marched in the Old City, marking the establishment of the DFLP and in commemoration of the Ibrahimi Mosque massacre, when Israeli terrorist Baruch Goldstein opened fire on worshipers in the holy site, killing 29 and wounded dozens. The army fired dozens of gas bombs and concussion grenades at the protesters and prevented them from reaching the mosque. In Nablus, in northern West Bank, the soldiers shot two Palestinians with live fire, and two others with rubber-coated steel bullets, after the army attacked protesters, who marched near Huwwara military roadblock, and at the main entrance of Beita town. In addition, illegal Israeli colonizers of Bracha outpost, which was built on private Palestinian lands south of Nablus, attacked many homes and fired live rounds. Furthermore, the soldiers attacked protesters in Kufur Qaddoum town, in the northern West bank governorate of Qalqilia, and fired many rubber-coated steel bullets, gas bombs and concussion grenades at them. In the Gaza Strip, medical sources have reported that the soldiers shot four Palestinians near Nahal Oz military base, east of Gaza city, before medics rushed them to a local hospital. They added that the soldiers shot three Palestinians near the Shuahada Graveyard, east of Jabalia refugee camp, in northern Gaza, and three others east of Khan Younis, in southern Gaza. Dozens of Palestinians also suffered the severe effects of teargas inhalation in several parts of the coastal region.